Water leaking from your water heater is a bad sign—regardless of where the leak is coming from. Need professional to repair your water heater ASAP? Just contact us and we’ll send over a plumber. Your cold water inlet valve is where cold, incoming water from your home’s main water line enters your water heater. If the valve itself (which sits higher up on the pipe) has gone bad, it will drip water down the pipe and onto the top of your water heater. If the pipe fitting is loose, you’ll see water coming from the location of the red arrow in the picture above. What to do: If the pipe fitting is loose and you see water leaking from this location, use a wrench to tighten the connection and stop the leaking. If water is dripping from the valve, you’ll need a professional to replace the valve. Your temperature and pressure relief valve (TPR valve) is a safety mechanism that only activates when the pressure/temperature inside your water heater tank is too high. When levels get too high, the valve opens and releases hot water to decrease the pressure inside the tank. During a normal discharge from your TPR valve, water should release via the “discharge pipe” that runs down the length of the water heater. Which means, if everything’s working correctly, you should only ever see water dripping near the floor if your TPR valve discharges. But sometimes, the valve itself (pointed out in the picture above) goes bad and doesn’t fully close, which will allow some hot water or steam to leak from this area. What to do: Have a professional replace the TPR valve if it’s leaking. This is an important safety feature that protects your water heater from rupturing due to high pressure levels. So if it’s leaking, that’s a good indication that the valve won’t work properly when it’s needed. Your anode rod is a long skinny rod that sits inside the water heater and prevents your tank from corroding. You see, over time, corrosive agents in your home’s water “eat up” the inside of the water heater. 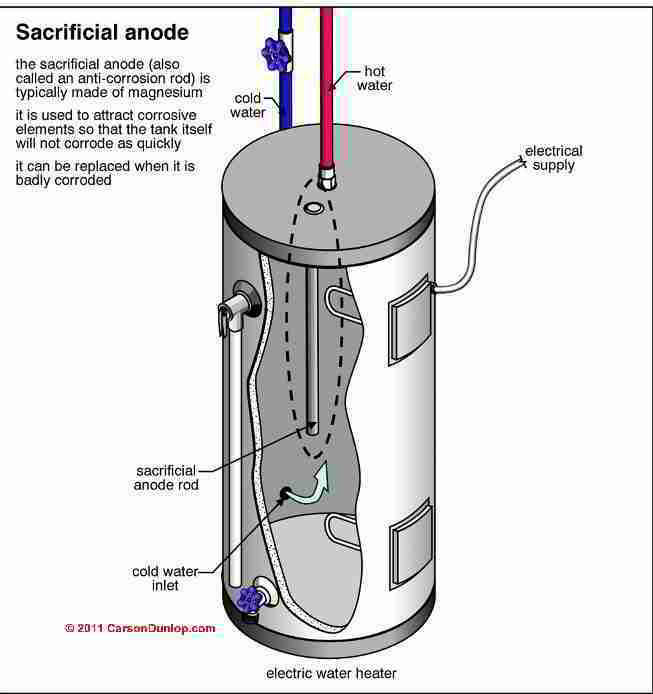 But the anode rod is designed to attract all those corrosive agents and “sacrifices” itself so that your water heater tank doesn’t corrode. But if the anode rod isn’t replaced once it starts corroding, the corrosion will reach the top of the anode rod and make water bubble up and leak out of the anode rod port (seen above). What to do: Have a professional replace your anode rod soon so that the inside of your water heater tank doesn’t start corroding. Some water heater systems include a smaller tank called the “expansion tank”. This tank sits off to the side of your water heater and is designed to catch any excess water from the water heater tank. You see, as water is heated, it expands. And sometimes, as water expands after being heated, it outgrows the space within the tank. When this happens, excess water is immediately sent to the expansion tank to lower pressure levels inside the water heater. But sometimes, due to wear and tear, your expansion tank may start leaking. What to do: Inspect the expansion tank to determine where the leak is located. If the leak comes from the pipe fiting (seen at the top of the tank), try using a wrench to tighten the fitting. If the leak comes from the tank itself, though, you’ll need a professional to repair or replace the expansion tank. ...you’ll see water dripping from the long, pipe that runs down the length of the water heater and stops about 6 inches from the floor. So what does this mean? Well, it means that your water heater has dangerously high pressure inside the tank. Your TPR valve (located at the top of the water heater) automatically opens to discharge water when it senses too high pressure levels. And when it opens, it releases water to the bottom of the water heater via the discharge pipe. Usually, a TPR valve that’s discharging is accompanied by a hissing noise. What to do: Have a professional inspect your water heater ASAP. They’ll be able to determine what’s causing high pressure levels inside the water heater and repair it. Your water heater’s drain valve allows a plumber to “flush” your water heater (that is, drain it, clean it and fill it back up). Over time, though, the drain valve may get clogged with particles or sediment from the water. And when this happens, it may not close properly and leak water. What to do: Have a professional replace the drain valve. ...you’ll need to call a professional to replace your water heater as soon as possible. You see, a leak in the tank itself most likely means that the tank is corroding from the inside out. And if the tank is leaking, it’s only a matter of time before the tank bursts, potentially causing expensive water damage. What to do: Consult a plumber to have the water heater replaced immediately. Need professional water heater repair in Tampa? Just contact us. We’ll send over an experienced plumber who can inspect and repair your water heater in no time. Why Does My Toilet Flush Twice?